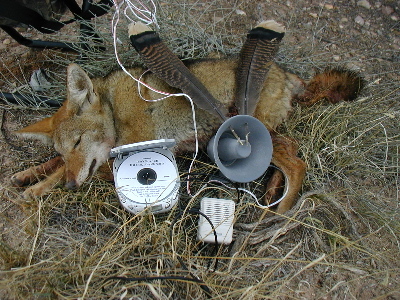 This is the 1st coyote to fall to my "if it bites, this calls 'em in" CD. I'm venturing into mp3 and like that a lot better. Good sound and compact. I'm not a great shot but did get this double. They came in together, the 1st one falling 20 yards from me. 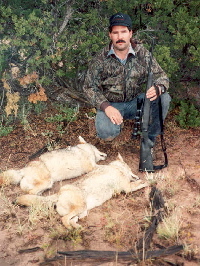 The second was Mach 2 and ran into my bullet at 150 yards. 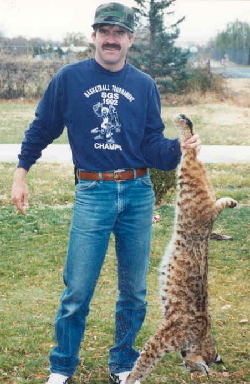 Kevin Lee called this large, red bobcat into range of a .22 magnum. The secret to these elusive cats is location and quality sound. He missed a shot and went back a week later and shot true.